My name is Candy Kahn and I have loved horses for as long as I can remember (and that’s a lot of years now). As a young girl I saved my baby sitting money and then walked up to West Hills Stable on Long Island, NY to rent a horse. In my early 20’s, a young mother of two, living in Flint Hill, VA, I purchased my first horse, Windy, a thoroughbred paint cross. 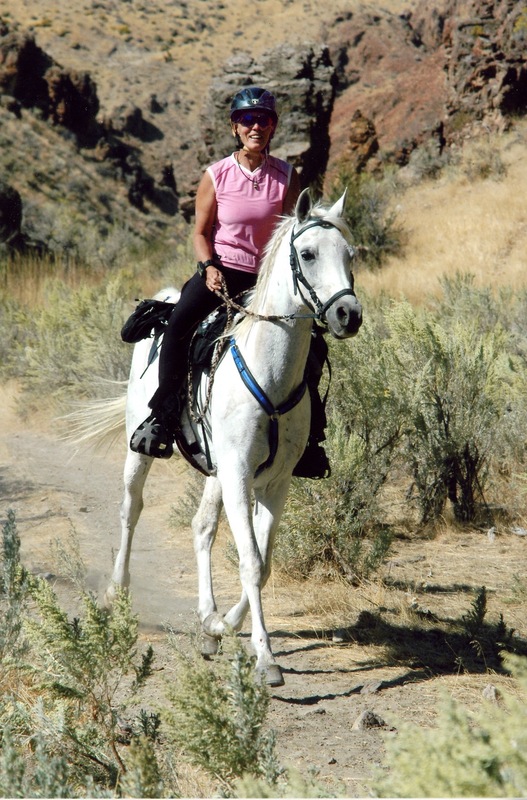 At that time, I was fortunate to meet and befriend Patty Alexander who introduced me to the sport of Competitive Trail, Endurance riding AND Arabian horses – I was hooked! After several years of riding, life stepped in and I was forced into a 25 year hiatus. I was able to have horses once again when I moved to a wonderful property in Jacksonville, Oregon. Oh boy had things changed! It seemed there were new things happening everywhere I looked: equipment (yeah Beta® and Biothane®), more women riding in endurance than men, heart rate monitors and GPS as training tools, helmets, and the list goes on and on. A few months after I bought Royal Rouge, a beautiful dappled grey Arabian gelding, and Sienna, a lovely chestnut mare, a friend introduced me to treeless saddles. I also decided to yank off the iron shoes and take my horses barefoot. At that time, there wasn’t anyone in my area trained to trim my horses using a barefoot trim method, so I decided to become a Certified Barefoot Trimmer and followed that up with a certification in horse massage. I was making rapid changes to my stewardship and knowledge of horses. I became so excited about what I was learning that I wanted to find a way to share my knowledge, experiences and research about barefoot horses and treeless saddles. In 2004, I convinced Garrett Ford, the owner of EasyCare, to allow me to sell EasyCare’s line of hoof boots. My goal was to encourage and convince other endurance and trail riders that they too could compete with a barefoot horse. (Back then the concept was pretty novel and some riders thought I was being incredibly cruel to my horses. Thankfully, a lot has evolved in the past 12 years.) Treeless saddles was another novel and controversial concept, but my experience showed me how much better my horses performed and treeless saddles had evolved well past being a “saddle pad with stirrups”. I began to sell Barefoot Treeless Saddles and import Freeform Treeless Saddles from Italy which birthed my retail company, Action Rider Tack. Fast forward to 2013 – I sold Action Rider Tack and, in early 2016, I sold my wholesale business Athletic Equine. I planned to finally retire, ride, hike and go back to creating glass art, my other passion. Full retirement didn’t sit well with me and I couldn’t get rid of the feeling that there’s more work I’m supposed to do in spreading the news about the welfare of the horse. After much thought and consideration I decided I simply have to be a Freeform Treeless Saddle representative. I love helping fellow riders.